The Psilocybe Pajaritos is a very social truffle that makes you very joyous. The word pajaritos means ‘little birds’ and it has acquired this name because you will feel like a little bird. Not because you believe you can fly, but because all kinds of happy thoughts are flapping around through your mind. 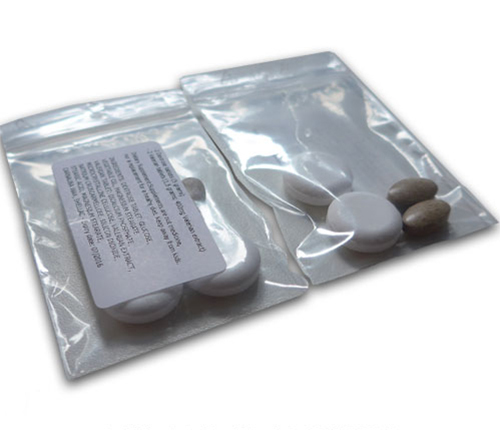 The Psilocybe Pajaritos is not very strong and therefore also suitable for beginning users. 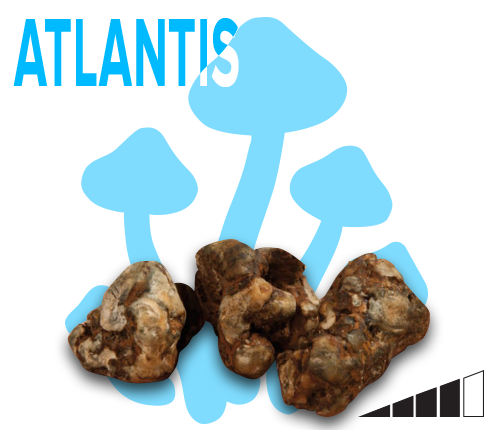 This species of magic truffles is ideal to use with friends. You can also use it at somewhat busier locations, because it will make you very joyous and the hallucinating effects are too much. The Psilocybe Pajaritos is also known as Mayan Magic. That is how the Mayas from Guatemala called it anyway. The Mayans, Aztecs and other inhabitants of South America have been using truffles and mushrooms for thousands of years during spiritual rituals and they attributed it with supernatural powers. 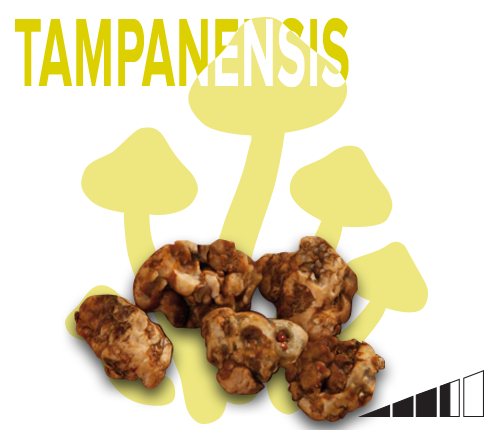 We, in the West, have only been familiarised with truffles and mushrooms since the sixties. If you are taking truffles for the first time, it is best to take half a portion to see how you are reacting to it. 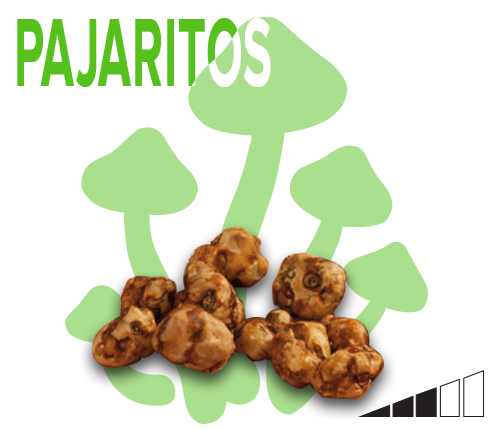 If you have taken truffles more often, then feel free to take a full portion of Pajaritos. If you would like a relaxed and happy trip, choose Pajaritos and allow yourself to be surprised by its fresh and clear effect. If you’re still a bit unsure about tripping, be sure to read our trip guides. I have 2 topics to my experience I wish to cover whilst ordering from this website. I would firstly like to state that the one star is purely in due to the product itself, not the service. I will start with the product and then I will start with the customer service. The Product: Terrible. Was my first ever experience using truffles and I feel I may have been scammed and sent duds. I ate the full lot and they did absolutely nothing. Tell a lie; they gave me a terrible stomach and the shits for a few days. They tasted horrible, but to be fair that doesn’t really matter, if they do the trick then who cares? (For the record, they tasted really, really, really bitter and extremely metallic, the taste lingered for a long while and could not be washed out.) I’ll tell you who cares, people who eat them, don’t get any high at all and get ill. I sat in my room and had drank plenty of water and had relaxing music playing with an incense stick burning; excited to have the time of my life. I even brought a friend over to oversee me to make sure I was okay and nothing went wrong as this was my first experience. Long story short, nothing at all happened, not even the tiniest change in mood. I was absolutely gutted and feel like I have been scammed and cheated out of my money. I am a student suffering with mental health issues and have tried all sort of methods of helping my issues, it took me a long while to decide whether to take psilocybin…..and when I did decide, I found myself buying this product from this website…..spending money I cant and couldn’t afford. But this was a big deal for me, so I invested…I was absolutely devastated to find they did not make me trip whatsoever, then later to my dismay, to find that they made me ill. Not only did I have the runs, but throwing up a couple of times along with a temperature. The international bank transfer cost me extra money, so I spent about £35-£40 on these thing just to find myself ill and unhappy. The second topic I would like to address is the customer service and the postage. It is extremely good and the sort of customer service every website and marketing business should strive for. I had to change the delivery address of my item and then keep it on hold whilst I could figure out an address, admin did just that. They were very respectful, pleasant and helpful. Also, from NL to UK delivery it took 4 days, which is extremely good and far exceeded my expectations. I also wonder if the customer service is as good as it is to push people into a sense of confidence to buy their products whilst the people running this website know the products are duds? Maybe, maybe not. These other reviews other than mine could be fake, or I could have simply got a bad batch. Sorry to hear about your disappointment. It’s a product of nature, so the experience is not exactly the same for every portion. Your personal body composition plays a part as well. Not everyone is equally sensitive. We hope you’ll be willing to try again. Five of us had a bag each. On empty stomachs and they kicked in pretty quickly. We laughed a lot and everything started to become much more interesting. The ceiling, the blanket, time, things people said and a spinning top. It can be too much with 5 people in a small space though and maybe not the whole bag for first timers. It was as expected based on the description. This is exactly what I was looking for. It’s been a long time since my mild experimentation in my youth. I have to admit to a certain amount of fear mixed in with my excitement about the use of psychedelics. Pajaritos were very mild as promised. The body sensation was very familiar from many years ago. Visuals were minimal except, or course, when I closed my eyes. Then there was vivid imagery and patterns and personal reverie. It’s the type of feeling that can be controlled which was important for me at this point. My strategy is to wade in gently, accustom myself to the experience at this level before moving into deeper waters. I split the order with another person and the dosage seemed perfect for both (8 or 9 grams each). Many thanks. Ordered online. Payment was a bit of a faff about, but delivery was quick enough, and items were fresh. Only took 5 gram dose on an empty stomach, but felt really euphoric. Had a fun afternoon, really chatty, and brain worked overtime. Went off on tangents, felt really happy and no bad effects. Truffles didn’t taste too bad, will take another dose tomorrow and see how it goes. I will definitely order again. Oh, I had so much fun with these. Nothing too overwhelming, just a blissful feeling for about 3 hours or so. This is perfect for the inexperienced tripper, 7.5 grams is the perfect dose. A stepping stone for the stronger strains. Service was second to none, ordered on Monday, received in the U.K. on Wednesday. Packaging was 5 star. Arrived very quickly indeed. Wasn’t too impressed though with the truffles, was my first time and my friend and I shared the pack. Very mild, it was like something good was ‘about to happen’ but it never really did maybe need to go stronger next time. So, that was our first experience we’ve ever had with Truffles, we both ate like 7,5gram so we both took a half. My friend just totally flipped out in a positive way. He just couldn’t believe that everything is so wonderful. The trip was very philosophic. The Optics were okay, but not the strongest. So for everyone who wants to laugh or just enjoy the nature i would highly recommend taking these. My friend even said it was the best expierience he ever had with “drugs”. very nice truffle species! the taste is typical sour, not many peoples preference, but i dont mind, with a VERY strong aftertaste.. =) not very visual trip but with an increased dosage you can sure achieve that.. the package came in within a couple days so very fast. thanx a lot! keep up the good work! 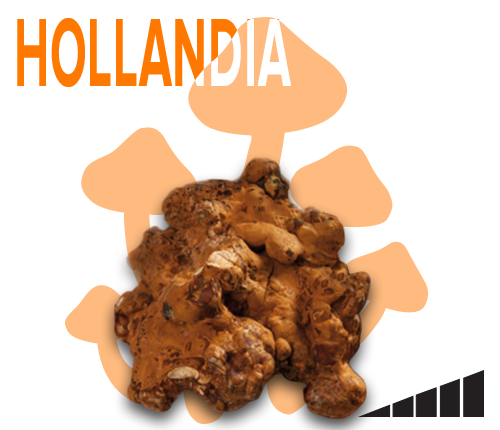 I previously ordered Hollandia truffles from Trufflemagic, and I would like to share my thoughts on this strain. The quality was pretty good, I should say. It the package it arrived in was tightly sealed, which made it easy to store directly after receiving it. When I opened it on the faithful day, the truffles were still fresh and firm. I ate about 8 grams, and it was an overall fun and mellow trip. This strain had the usual feel-good, psychoactive effect. The visuals were low, about average I would say (compared to other strains). Like, if you’d look at a poster, the image might seem a tad “warped”, and your distance and depth perception is slightly altered. So like when you’re talking to your friends, it may seem that they are far away, or that their heads are huge. And offcourse, the drop in IQ is inevitable (like any other strain), which makes it fun, especially around good friends. What I really liked about this strain was that I became veeeery outspoken. Usually on truffle trips I just become very retarded, and say everything that comes to mind, hoping it comes out coherent, but it usually doesn’t. But with this strain, the I could actually articulate in a humanly manner. It gave me a very creative mind, I would say. Definitely not the strongest strain I’ve tried. It was very easy to handle. But my personal view on truffles is that the trip highly depends on the person’s mental state and surroundings, so the trip some one else might experience could differ. I see truffle trips as something relative, so it’s hard to rate the trip, since all you can do is compare it to other trips.